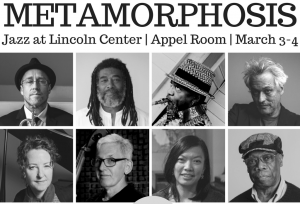 We’re offering discount tickets for Metamorphosis! 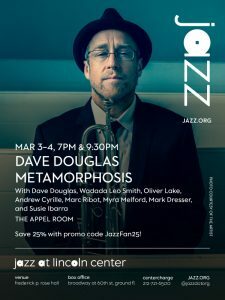 The live premiere of Dave Douglas’ Metamorphosis takes place at the Appel Room at Jazz at Lincoln Center on March 3 and 4 featuring outstanding improvisers Wadada Leo Smith, Oliver Lake, Marc Ribot, Myra Melford, Mark Dresser, Susie Ibarra, and Andrew Cyrille. Based on the composition that comprises our 2017 Subscriber Series, these performances are sure to be enthralling. We’re offering special discount tickets to the Greenleaf community! Save 25% when you use the discount code “JazzFan25” when you purchase your tickets online, at the box office or through CenterCharge. Don’t miss your chance to see the live debut of this unique ensemble.